“Tell us how you support arts and culture and you could win a 3 night get-away for 2 to a Fairmont Hotel or Resort in Canada, and Sun Life Financial will donate $5,000 to a Canadian artist or cultural organization of your choice. Enter now at culturedays.ca/contest! Contest closes 27/09/2015. Subject to official Rules. Don’t forget to plan your Culture Days weekend on culturedays.ca using the Bright Spots Schedule. Canada’s Ontario Culture Days has teamed up with Craft Ontario to encourage craft makers to offer FREE hands-on craft activities to the public during the Culture Days weekend that launches on September 25-27, 2015. More than 150 FREE craft activities are offered across the province. Teresa Seaton will demonstrate copper-foiling technique for stained glass at her Burlington gallery. Jaroslav-Jerry Vrabec merges his engineering and aviation training with his artistic sensibilities to create striking metal and mixed media sculptures. Tour behind the scenes at his Metal Works Studio in London. Paint your own clay tile at the Gardiner Museum during the Bloor St. Culture Corridor Hub in Toronto. Celebrate 55 years of the Thunder Bay Weavers and Spinners Guild with demonstrations, workshops and displays of weaving looms, spinning wheels and other equipment. In Gravenhurst, Linda Kristin Blix will host a drop-in family-friendly introduction to printmaking, using simple techniques and materials. It’s easy to find other craft-related activities in your communities by selecting “craft” as a search category on the Culture Days website. 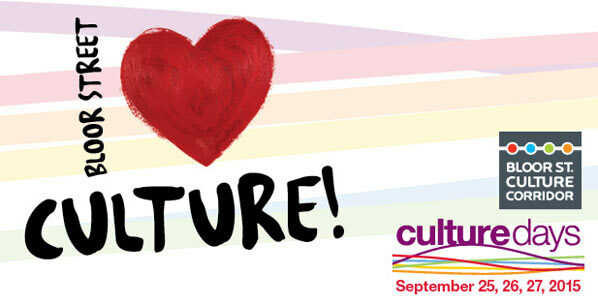 Also, the Bloor St. Culture Corridor – Toronto’s most diverse arts and culture district – celebrates the sixth annual Culture Days weekend taking place Friday, September 25 through Sunday, September 27, 2015 with the Culture Days Bloor St. Culture Corridor Hub. More than 15 free events and activities will be offered at leading arts and culture destinations on Bloor St. West. The Bloor St. Culture Corridor invites everyone to create, participate, share, and celebrate culture in the heart of Toronto. TORONTO, Canada (September 4, 2015): The Bloor St. Culture Corridor – Toronto’s most diverse arts and culture district – celebrates the sixth annual Culture Days weekend taking place Friday, September 25 through Sunday, September 27, 2015 with the Culture Days Bloor St. Culture Corridor Hub. More than 15 free events and activities will be offered at leading arts and culture destinations on Bloor St. West. The Bloor St. Culture Corridor invites everyone to create, participate, share, and celebrate culture in the heart of Toronto.